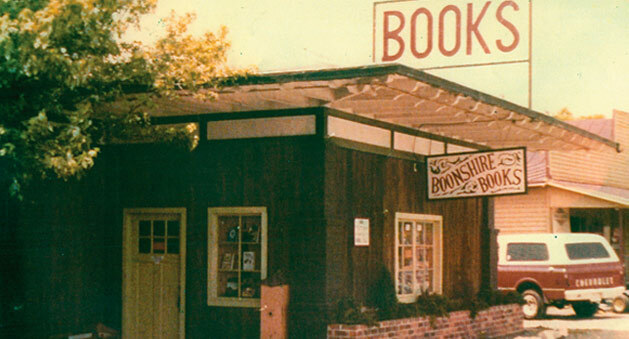 George and Sylvia Givens — a frustrated teacher and a game-for-anything wife and mother — opened Boonshire Books in 1976 in an old gas station on Boonsboro road. After clearing away the fumes and cobwebs and covering up the oil stains with remnant carpeting, they began a legacy that has since gone through many incarnations. In 1980, the Givenses moved the business across town and changed the store’s name to reflect the family moniker. Their son Danny and former wife Kathy, opened Little Dickens in 1989 in a space not much bigger than their growing family’s minivan. When George officially retired in 1999, Givens Books changed generational hands and the business once again moved , this time just a stone’s throw away to the current location at 2236 Lakeside Drive, at which time Givens Books and Little Dickens merged into one store with 16,000 sq feet of books, new and used, toys, gifts and teaching supplies. On any given day, you’re likely to trip over a Givens or two if you wander into the store. Sarah, the youngest of George and Sylvia’s children, manages the book operations while Danny oversees the business, and Sylvia, who thankfully will never retire, plays the matriarch — a well-earned title for someone who has been there from the beginning. The entire Givens family and all the employees we’ve claimed as family along the way would like to thank our customers for allowing us to serve the greater Lynchburg area for over three decades, and we look forward to a future as meaningful as our past.